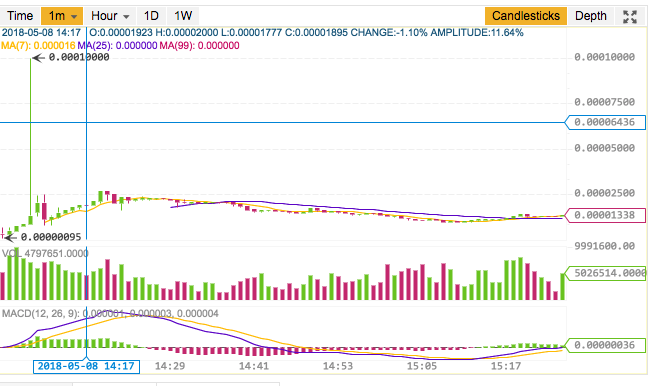 Bytecoin (BCN) listed on Binance (BNB) yesterday – arguably the leading exchange in the world, and the price & volume effect was staggering. In a day where Bitcoin (BTC) traded in a 2.7% range, the action in BCN was certainly a stark contrast. Prior to the listing, BCN was hovering around $0.007 (0.7 cents), which implied a market cap of $1.28 billion based on the coin supply of 183.88 billion. 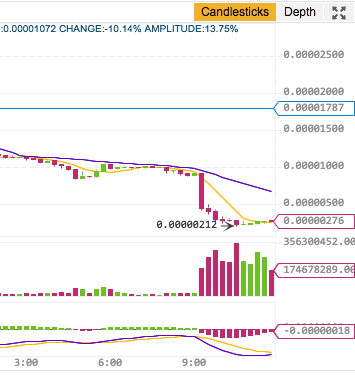 And when the listing started, the price went bananas, as you can see in the Binance market chart below. No, you are not mistaken. The brief “fat finger” trade (meaning an unintentional trade that happened due to human error) high price reached 0.0001 BCN/BTC which implied a whopping price of $0.9 (90 cents) leading to a market cap in excessive of $165 billion. That was more or less the same market cap as BTC at that same point in time! 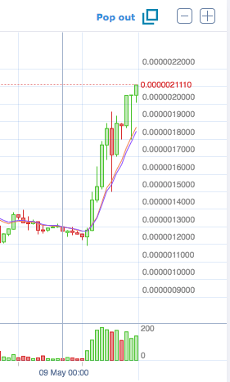 This is eye-popping and is just another confirmation that a listing on Binance causes extreme euphoria. When put into valuation context, this price absolutely doesn’t make sense – it’s a screaming sell. Please don’t be the sheep that buys blind, and always use quantitative metrics as a sanity check. This spike however was brief and we ended up settling around a realistic high price of 0.000025 or $0.23 for the next hour, which is still 33X the price the day before! On HitBTC the time scale is on UTC (which is HKT – 8 hours), and at the same point in time was trading 0.00000198. This is an entire ONE decimal place smaller. This implied a price of $0.0184 or 1.84 cents which is still a roughly 160% increase from the day before the announcement. Compare this to the Binance price of $0.23, and you can see it is a 12X difference on the same coin at the same time! Get Notified for Our News Feature Release! Enter your email address below and we'll notify you as soon as our CoinFi News feature is available to use so that you can be the fastest to know the market movements and take action! Buy on HitBTC at $0.0184. Sell on Binance at $0.23. Sounds easy right? Well, as you might have guessed already. 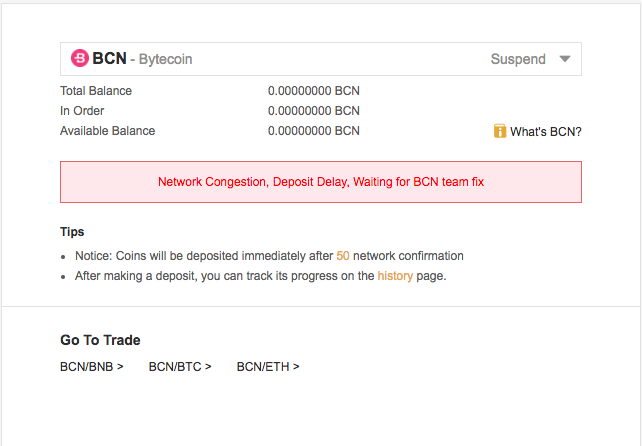 During this time, you could not deposit BCN on Binance. And likewise on HitBTC, you couldn’t withdraw. So even if you thought of this idea, you wouldn’t be able to take advantage of it unless you managed to sneak BCN onto Binance. What Happened When Deposits & Withdrawals Go Back Online? So when deposits and withdrawals are back online, how fast does this opportunity disappear? In the screenshots below, at around 01:00 UTC the day after on 5/9 when withdrawals & deposits were enabled, we saw a convergence in price, with a sharp drop in Binance BCN/BTC and a rise in HitBTC BCN/BTC as market participants are now able to arbitrage the market. Interestingly, you can see that even with withdrawals and deposits for BCN enabled, there still is a stark price difference with price on HitBTC of 0.0000021 vs Binance 0.00000276 which is more than a 31% difference to pocket! The question is even at 31%, is it worth the hassle and the risk? In our opinion, it really depends on the size of the coin coupled with the risk that there will be more freezes in the blockchain when transferring onto Binance, in which your BCN will just be stuck in limbo. Remember BCN was a $1.28 billion market cap coin with some decent liquidity prior to the Binance listing (although now on the leading exchange it will likely trade higher), and a 31% return certainly justifies the time risk of moving the coin from one exchange to another, as it is not that likely to drop the same amount during that time. We were able to take advantage of this because we pretty much sat in front of our screens refreshing our wallets non-stop, so ultimately being fast is vital. If it were a much smaller alt-coin with a smaller reputation, we would expect a larger return in order to justify the risk, and that limbo time would likely mean a higher chance of the coin being dumped. Likely by the time this article is published, the arbitrage would have closed significantly. So how do we take advantage of this in the future and what tools might we need? 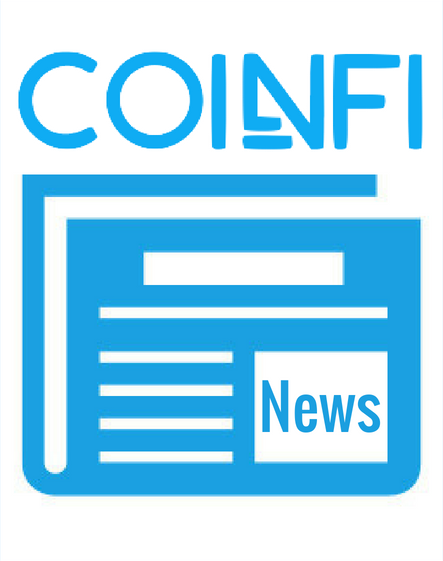 At CoinFi, as part of our CoinFi News platform, we will use in-house algorithms to detect new exchange listings and notify our users. If you are the fastest to know of a new exchange listing, you can get ahead of the market and buy BCN before everyone else does, and at the very minimum pocket the 160% increase on HitBTC, even if you don’t manage to send the coins to Binance to sell higher.